Pancreatic β cell dysfunction is a hallmark of diabetes mellitus and is characterized by alterations in insulin granule trafficking. Exocytosis and endocytosis of insulin granules are precisely coordinated in response to insulin demand; however, the factors that regulate this process are not fully known. Fan Fan and colleagues at the University of Wisconsin-Madison identified an endocytic regulatory mechanism that influences insulin secretory capacity by employing a mouse model that allows β cell-specific, tamoxifen-inducible deletion of dynamin 2 (Dnm2), which mediates release of free endocytic vessels from the plasma membrane. Loss of DNM2 in β cells resulted in glucose intolerance and a reduction in the second-phase of glucose-stimulated insulin secretion. DNM2-deficient cells maintained normal glucose metabolism and Ca2+ signaling and retained similar numbers of insulin granules as WT cells; however, DNM2 deficiency impaired exocytosis-endocytosis coupling efficiency and clathrin-mediated endocytosis, resulting in the accumulation of clathrin-coated endocytic intermediates at the plasma membrane, as well as a marked restructuring of actin filaments and impairment of insulin granule recruitment during the second phase of insulin release. Together, these results reveal that DNM2 is required for in insulin secretion and link defects in β cell endocytosis to diabetes mellitus. The accompanying image is a 3D reconstruction of endocytic profiles within a DNM2-deficient β cell following glucose stimulation. 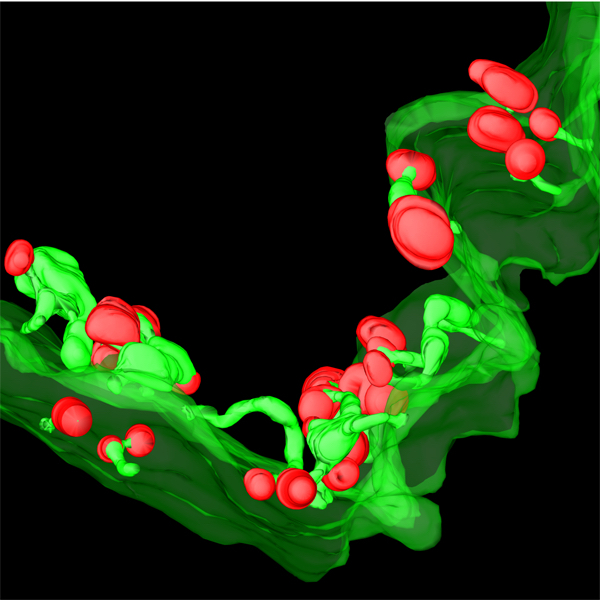 There is an abundance of clathrin-coated profiles (red) connected to the plasma membrane (dark green) by unique endocytic intermediate structures (light green) that are reminiscent of structures observed in dynamin-deficient central synapses, which have endocytic defects. Citation Information: J Clin Invest. 2015;125(11):4026-4041. https://doi.org/10.1172/JCI80652. Alterations in insulin granule exocytosis and endocytosis are paramount to pancreatic β cell dysfunction in diabetes mellitus. Here, using temporally controlled gene ablation specifically in β cells in mice, we identified an essential role of dynamin 2 GTPase in preserving normal biphasic insulin secretion and blood glucose homeostasis. Dynamin 2 deletion in β cells caused glucose intolerance and substantial reduction of the second phase of glucose-stimulated insulin secretion (GSIS); however, mutant β cells still maintained abundant insulin granules, with no signs of cell surface expansion. Compared with control β cells, real-time capacitance measurements demonstrated that exocytosis-endocytosis coupling was less efficient but not abolished; clathrin-mediated endocytosis (CME) was severely impaired at the step of membrane fission, which resulted in accumulation of clathrin-coated endocytic intermediates on the plasma membrane. Moreover, dynamin 2 ablation in β cells led to striking reorganization and enhancement of actin filaments, and insulin granule recruitment and mobilization were impaired at the later stage of GSIS. Together, our results demonstrate that dynamin 2 regulates insulin secretory capacity and dynamics in vivo through a mechanism depending on CME and F-actin remodeling. Moreover, this study indicates a potential pathophysiological link between endocytosis and diabetes mellitus.